Taylors Garages Premier Division (KO 6.30pm): Heckington Millers v Swineshead Inst (P. Stimson), Spilsby Town v Skegness Town Res (G. Hurst). 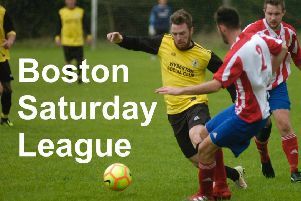 Taylors Ford Division Two (KO 6.30pm): Kirton Town Res v Fishtoft Res (N. Lea). Taylors Ford Division Two (KO 6.30pm): Sibsey v Railway Ath (S. Lea). SHS Allum Ltd Fishtoft Cup, final (KO 7pm - at DWB Stadium, Boston Town): Benington v Wyberton Res (D. Tunnicliffe, G, Hurst, S. Beaumont, D. Avison). Kirton Cup, semi-final (KO 6.15pm - at Graves Park): Pointon v FC Wrangle (T. Page).